A long time ago I received the trailer for this film. Now we have a release date, a poster and a making of featurette. We still don't have a true synopsis but the trailer does make it look like a normal show with some "cutaways"
Written and directed by Andrew Adamson ("Shrek," "The Chronicles of Narnia: The Lion, the Witch and the Wardrobe"), and executive produced by Academy Award ® winning filmmaker James Cameron, the 3D film event features artistic and acrobatic performances from some of the most elaborate Cirque du Soleil productions. The film was produced by Adamson, Aron Warner, Cirque’s Martin Bolduc and Ed Jones and Cary Granat. Vince Pace oversaw the 3D stereo production aspect of the film. A number of production companies collaborated to bring the film to life. In addition to Cirque, Warner and Adamson’s Strange Weather Productions, Reel FX and Cameron Pace Group all contributed to this ground breaking production. "The coupling of filmmaker James Cameron’s ground breaking 3D visual accomplishments and Andrew Adamson’s beautiful direction, combined with a timeless original story written especially for this movie, will make for a truly amazing movie going experience for audiences of all ages " said Rob Moore, Vice Chairman of Paramount Pictures. 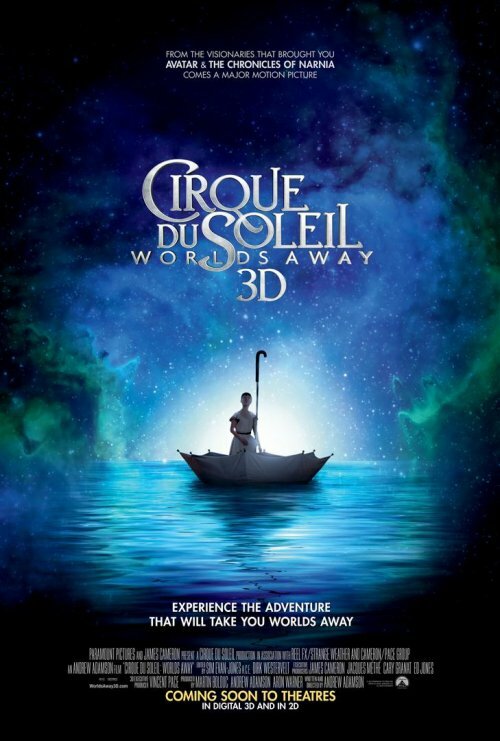 The Stunning Cirque Du Soleil: World's Away 3D Will be EXCLUSIVELY IN CINEMAS FEBRUARY 3 & 5, 2013.